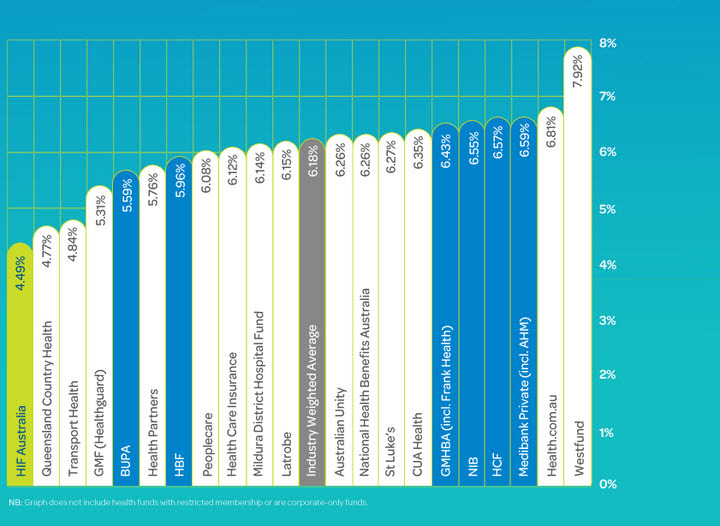 Every year on the 1st of April the Australian Health funds increase the cost of their health premiums including 457 health insurance. You can compare this to the 2014 price rise on our site. If you already have 457 visa health insurance you should have received a letter by your health fund notifying you of the price for your policy. Your policy price will automatically increase to this price on the date highlighted in the letter which is the 1st of April for most health funds. If your looking to purchase 457 visa health insurance then the prices you see on the website are not accurate as they will increase in just a few days. As the graph above highlights, these increases differ by funds so what may seem the best cover policy right now may not be in the future! How can I avoid the price rise? There is one technique many Australian and 457 visa holders use each year which is pre-payment of their policy. 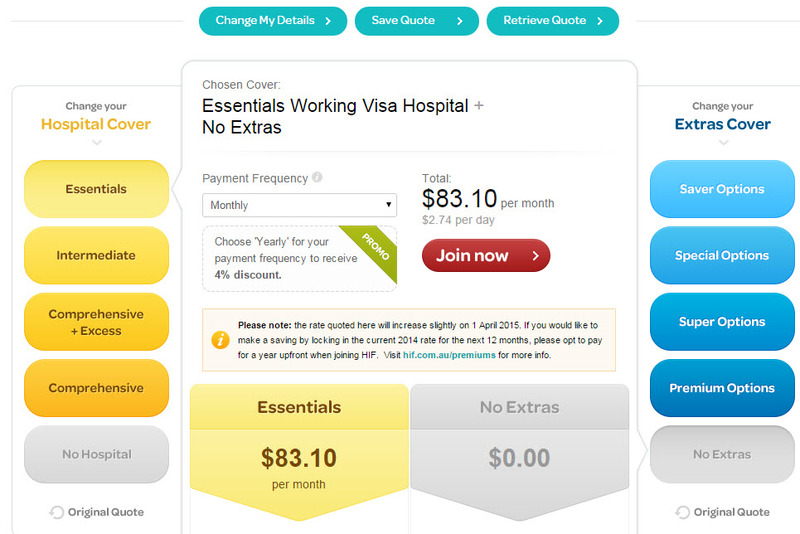 Australian health companies will allow you to pre-pay up to 12 months worth of policy at any time. This policy rate is locked in at the current prices so effectively you can avoid paying the higher premiums for a period of 12 months. HIF also offers a 4% discount for policy holders who prepay their policy for 12 months. It should be noted while HIF is unique in this 4% off respect, funds such as Frank Health Insurance, IMAN and Australian Unity also offer pre-payment. Simply choose the ‘payment frequency’ as yearly on their sites as you can see with the two screenshots below of Frank and IMAN respectively. If you have an existing policy and your not willing to pre-pay for a year then from the 1st of April you should shop around to ensure you have the best value 457 health insurance policy for you. There are no visa penalties for changing Australian health funds and when you join a new health company you can ask them to notify the other company of your lapse. When you change Australian health companies any waiting periods that you served on the prior policy is transferred across. So for example if you had a prior policy that included maternity cover and you transfer to another fund also with maternity cover you don’t need to wait another 12 months until it’s activated. 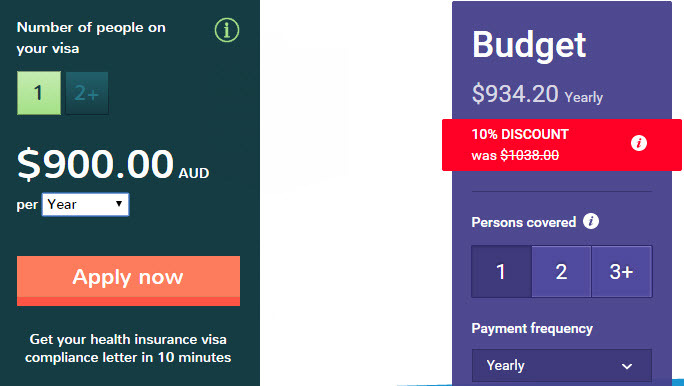 From the 1st of April this website will update with the newest prices so you can bookmark the 457 visa health insurance comparison page and see what the newest prices and best value policies are. All the policies will be re-evaluated at this date so not only 457 health insurance prices will change but also the recommendations below it. Please not that this task will take time so please be patient.